Hi, thanks to the helpful suggestions here for file hosting sites, and thanks to those that helped me to get my DAW running better. 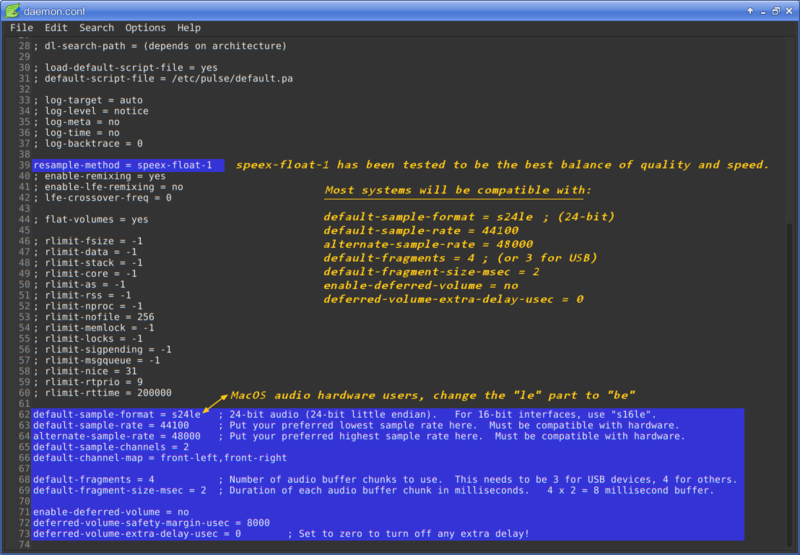 I'm taking a break from composing for a while, but it also gives me a chance to focus on writing a Linux DAW blog! I don't have much on it yet, but the first data uploaded does have some of the main PulseAudio tweaks that got me into the ballpark of running 32-bit REAPER, 32-bit FL Studio, and 32-bit Windows EnergyXT on Linuxes. 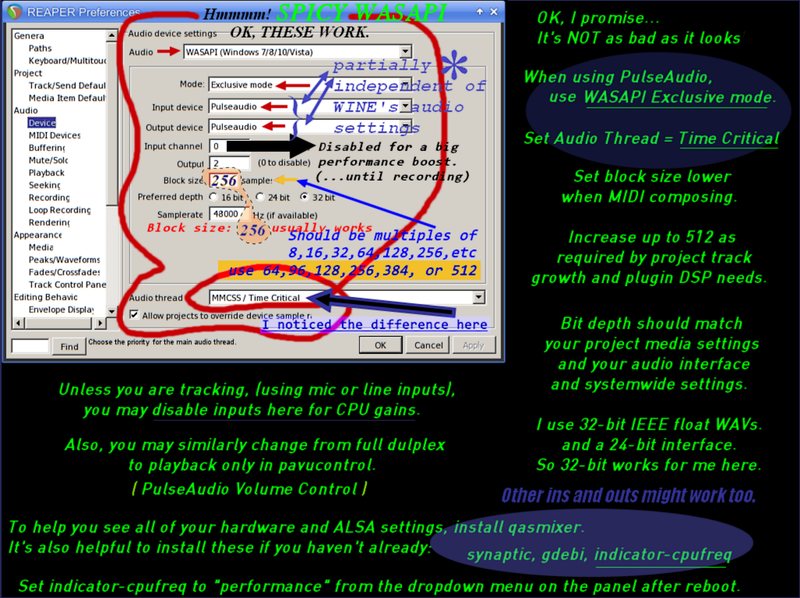 Entitled, "Linux DAW Extra Help"
From there, you will be able to link to and/or download screenshots that hopefully explain tricky or easy Linux Digital Audio Workstation (DAW) tweaks and optimizations. Later on, I will be adding animated .GIFs (instead of videos) and also a lot more explanatory texts and a PDF file that has everything except for the animations. The nice thing is, since I'm doing it piece by piece, you don't have to wait for the final format to get tips. You can get them as I go along. Since they are mostly just images with text annotations, they can be read on most internet devices but can also be archived easily and looked at while offline without taking up much RAM or CPU time. This one is hard to find out about. I think I first learned about it from Puppy Studio's implementation. Most people don't use Puppy Linux for WINE and REAPER, but Puppy Studio did! So they knew some tricks! Just so ya know, I'm going to be reviewing my own settings at home to see what I had while my system is still working great. Also, I will be installing a 64-bit system from scratch, so I will have a chance to get fresh results that way too. Currently my system is only 32-bit (because I love all of my 32-bit classic VST instruments and effects). That's perhaps one of the best sections, but I didn't explain it very well enough in a way that won't scare people. But for those who comprehend it already, maybe it already makes you happier for your 32-bit REAPER. That one is really nice, it allows you to switch the CPU governor to "Performance" at the click of a button from your taskbar. I'm actually going to save that one as a .DEB in case it stops being available, because it's too powerful to risk losing. I know that if somebody quits their Linux hobby or passes away or gets arrested or whatnot a lot of good info can just disappear. Sometimes good websites get shut down or the servers are bought and sold and purged. Since some Linux DAW tips can't be found on more than just a few sites, I want to help put that info back into the hands of average users who don't have as much time on their hands as me or who don't feel like searching and downloading from a whole humongous range of multiple sites. I'd like ideally to help make Linux more powerful for music use, and to keep it with vitality and to make people stop questioning it's power so much. I'd like for Linux musician's anywhere to have more confidence that the tips they recieve this year are not as out of date as they used to be. OK, I'm still in the process of learning how to manage and edit remotely at the archive.org site. It's not as easy as I thought, but it's still pretty cool. I haven't been able to get much done yet, but I'll try to do most of the work offline, and upload the results all at ones. Consider what is already up to be kinda just a test run. That's why some of the images don't explain anything and don't seem to be that helpful yet. I haven't written on those yet and uploaded the other related images. If I can, this weekend I'll see how the site handles animated GIFs. It also appears that to host video and sound I have to create separate libraries, which isn't totally in my interests--I'd like it to be centralised. But the .PNG format is pretty good and I have a fun idea for embedded .PNG's to contain retreivable "watermark" text that is either some tiny MIDI files or [ code ] [ /code ] types of text that isn't easy to transmit and recieve. Pretty much everybody knows how to look up and download and often even post up an image on a forum. So images are easy to share and archive. They can be put on a CD-ROM and if jpg, watched on a portable media player or some DVD players. They show up well on tablets and laptops and desktops. They can be sent as email attachments easily or even seen on archaic web services if they still exist. They can be integrated into videos and work with fun stuff like Matroska files or chroma key backgrounds or whatnot. They don't take up much space either, unlike videos. I recently pawned my microphone, so I won't be using that, but I did recently install ALL of the Linux mbrola voices! 400 MB or so, and kinda fun. So that might be "who" does an audio podcast that I might post up. If I do a video, I'll probably put that up on Vimeo.com They are pretty decent and I've used their service before. That site is easy to navigate and search and OpenShot already has compatible presets. So anyhow, here's something I just added a few minutes ago. It's not in a proper context yet, but I might as well share it to get it into the "spacetime continuum" of the internet. 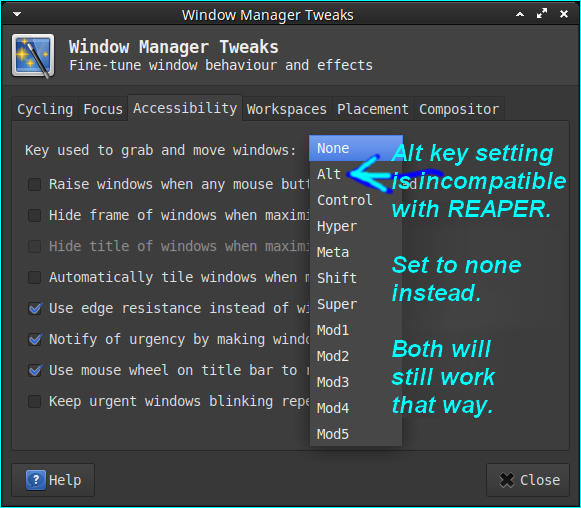 Essentially, if you are using the Windows REAPER in Wine, unless you change your Linux window grabbing technique, you won't be able to timestretch audio clips in REAPER by dragging the WAV clip edge while holding down the ALT key. Luckily, most distros have a Window settings or Window manager tweaks control screen where you can fix this. XFCE is what I use, so that's what you'll see every time. That's exactly the type of info I will have. It's about how to use Linux to do audio tasks, even if and especially if part of it is Windows-related somehow. But you'll never see me using Windows OS, because I never will again. I only use Linux. I won't be showing MacOS stuff either. Some future tips will not be about Wine at all. I plan to explain in a better spot, like I did elsewhere the case for ext3 DAW formatting over ext4 or any other partition format. I will hopefully be able to mention fstab settings without making mistakes, disabling eyecandy, why you can leave compositing on, why and how to keep a SWAP partition instead of letting Ubiquity do it for you, and hopefully a more inclusive list of Windows-compatible programs which tend to run on Linux via WINE instead of just focussing on REAPER (supported)and occasionally FL Studio (not supported, but still works pretty well). For example, MuLab seems to work OK although recently I had trouble getting MUX to work. I might actually purchase MuLab because I like the semi-modular flow and I might take a vacation from REAPER until REAPER for Linux is more complete in terms of MIDI support. I anticipate that it could take a long time because the regular win32/win64 Reaper seems to get fixes and features for audio/automation/scripting/videos much more than fixes and features for basic MIDI recording and editing. Notation even got more love than basic MIDI troubles within REAPER. The REAPER devs are cool people, and they even admit that they are more into audio than MIDI, but I'm a MIDI guy thru and thru and I work with VST(i)'s constantly. I just recently installed a 64-bit Linux beside my 32-bit Linux so I can at least finally demo some more recent stuff that's not available as 32-bit. But I will probably still mention stuff like how 4 GiB of RAM has been the golden standard for all OSes such a long time that most systems can be just fine at that limit. The end goal is to have uploaded as much stuff as I've downloaded in terms of infos that I learned that got me to be able to ditch Windows OS and Mac OS entirely up to and excluding the wonderful independent VST(i) freewares and paywares and nice stuff like Foobar2000 and AudioMove and r8brain and OcenAudio and Wavosaur... you get the idea. I will not be trying to criticize or compare with Linux. I like Linux and use a lot of Linux programs regularly. I will try and give good mention of Linux programs too, but much of those are well-explained already by others. I will possibly give some extended help info about the benefits of keeping Puppy Linux around as a DAW pre-configuration and rescue tool. Right now, I use GRUB4DOS off of Puppy Linux as an easily customizeable bootloader menu. I like it alot. 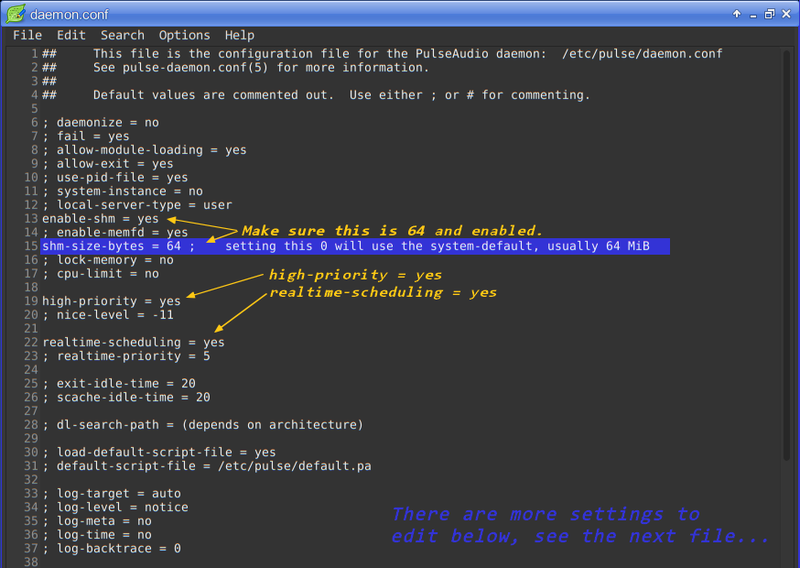 Modern kernel parameters work in it too! i don't even know much at all about the formatting of the Linux boot folder, but I finally got a clue about vmlinuz and images so it's not too bad. I don't want to be replicating anybody elses advice per se, but it will happen a little bit. If u think I need to site my sources better, I will try to do that at the end; for now the sources are THE INTERNET (look it up for cross-reference). I will make mistakes, but try to fix them. I also don't want to get into arguments, so probably the best result would be if I find the most concise format of distribution of info, and go with that. OK, back to some random tips. Posting them here helps me to get an idea of how well I am or am not working yet. But I will try to not have so much text other than the basic explanation of each .PNG tip image. Eventually, every image will have the text written within it, so there won't *be* any text files or forum webpages to have to go to. Somebody will be able to do an image search on a web search engine and instead of getting a link to a bulky video, they will be able to see almost instantly some info that they can save and/or print or even archive into a 7zip or zip or pea, or tbz/tgz/bz2/lzma or whatever. I'm the type of person who doesn't typically own an expensive smartphone, but I still use it to see images on the web sometimes. I like the idea of people who can't afford a lot of bandwidth to still be able to get a trove of good decent info in a format that looks prettier than ASCII art. (of course ASCII art is beautiful too and got the job done!). I'm gonna try some experiements with Matroska files when I get around to the video stuff. I love how modular that format is. You could put just about anything into a Matroska. MKA's (Matroska Audio) doesn't get enough love. yeah, videos are fun, but I'm an audiophile! I want to find out what kinds of tricks I can do with those that are both aesthetically and technically and "linux-audio-ly" appealing. I won't be using VP8 or VP8, but it's worth mentioning that WebM files are just MKV's with VP8 or 9 and some other constraints. I like the idea of giving some love and life to a MKA or maybe MKV with embedded text, PNG, .GIF, a nice PNG cover and icon and having it all be a nice expression about the success capabilities of Linux and audio together, and maybe with a nice soundtrack. I could add subtitles too. It's possible i won't get done nearly as much as I expect to, but already this year I got more done than I expect to last year. This tip is roughly about how if you disable some screen animation via the meters in REAPER on Wine, you regain some CPU power. This is how to accomplish that. I discovered that while trying to get Puppy Studio (a Puppy Linux distro based upon Ubuntu Studio) to run more smoothly. It turns out to be true for a lot of other stuff too. It takes effort to render multiple simultaneous non-syndicated animations realtime. If you don't need all of them at all, turn them off and your system will thank you. Of course, if you have a fancy video card it might not matter at all. But if you're like me, you opted for a 12 dollar video PCI card instead of a 1200 dollar gaming card. These days, I'm on a laptop and might not even have proprietary drivers activated for video. I just want to be audio focussed. But anyhow, realistically, there will be times when I'm too busy making music to want to post up DAW tips. Is an integration time of 5 s not much too long. Don ´t you just average short clippings with such a long window? Why do you go the route via Pulse Audio btw.? lilith wrote: Is an integration time of 5 s not much too long. Don ´t you just average short clippings with such a long window? I remember when I first discovered lowering the CPU load by changing the mtering of Reaper, the fewer animation activity, the most stable the audio playback was. 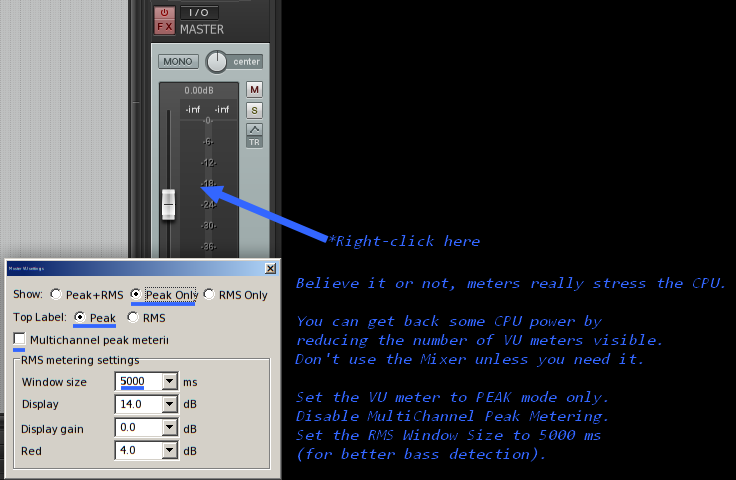 So then I started right-clicking on the remaining meters and I saw that VU meter option set. I experimented with the settings and that longer window is what I ended up with. I do know from experiences with Reaper and with other windowed meters or similar software it's not a problem for the LED style meters. It might make them more like VU style meters, but probably not. I think it just makes the VU meters a bit slower. But that's kinda negligeable because VU meters are already slow and already represent an average and don't react to transients really. But if the windowing of either type of meter is too shallow, it won't be responding to any bass at all. I tend to use LED peak metering for most activity, and for average levels, I use freeware RMS Buddy VST to get the root-mean-square (RMS) function. Typically, a good tune will be between -14 dBfs RMS and 11 dBfs RMS, often -13 dBfs RMS is great from what I get when I scan other people's great tunes and good tunes of mine also.